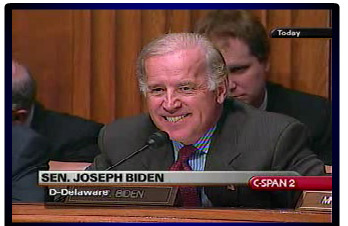 This hysterical and fist-pumping eight-minute C-SPAN clip is why I fell in love with Joe Biden in 2004. First, there's the whole, "It's so rare we get to see you, Attorney General Ashcroft -- we miss you!" and him telling Ashcroft "You're as generic as they come!" while smiling (in the first 5 minutes), but really it's when Biden goes off on why we have the Geneva Convention -- why we ABIDE by the Geneva Convention --- that is fraught with awesomeness. About 7:30 minutes in, Biden spits, "There's a REASON why we sign these TREATIES -- to PROTECT my SON in the military. That's why we have these treaties! So when AMERICANS are captured, they ARE! NOT! TORTURED! That's the reason -- in case anybody forgets it -- THAT IS THE REASON!"